There’s nothing more heartbreaking than discovering that your four-legged family member is sick. Like humans, dogs are susceptible to a lot of illnesses, and some of those illnesses are (if you can believe it) related to parasitic worms. Parasitic worms can be found in a variety of areas that your dog may tend to frequent – or even eat. For instance, if he tends to eat things he finds outside or lap up puddles of water; or, if he enjoys rolling around and sniffing in the calling cards that other dogs and animals leave behind (it’s canine nature! ), then your dog is in serious threat of catching parasitic worms. Now that you have had quick peek at our top five choices for the best dog worm medication, let’s take a look at each product in greater detail. Below, we provide a more in-depth look at each of these over the counter dewormer for dogs’ products. We discuss their features, what we like about them, and what users have had to say, as well. After you have read through the reviews and decided which dog dewormer you would like to purchase, click on the buttons to find the best prices currently available on Chewy and Amazon. Our first choice for the best dog dewormer is the 8 in 1 Safe-Guard Canine Dewormer for Dogs by Excel. This product is designed to treat the worms that affect dogs the most, including roundworms, tapeworms, hookdworms, and whipworm; all of which can pose serious threats to your pup if they are not promptly eradicated. The active ingredient in this dog dewormer from Excel is fenbendazole, which is one of the highest quality, safest, and most effective treatments for worms. With this ingredient, you can rest assured that your pup will receive the very best of care. The granule formula of this treatment is easy to administer; simply mix it into dry dog food or wet dog food and have your pet eat it down. To be effective, your dog must be given one does every day for three days in a row. This dosage will provide your furry friend with up to six months of protection. Each package of 8 in 1 Safeguard Canine Dewormer for Dogs comes with three pouches, each of which contains four grams of formula. Each pouch treats dogs up to 40 pounds, and is safe for puppies as young as 6 weeks, as well as expecting dogs, and those who have a heartworm infection. Final Verdict: Based on our own assessment, the input of our panel, and the reviews that we read, Excel 8 in 1 Safe-Guard Canine Dewormer for Dogs is a great product, and a great price. The majority of people say that it offers great results, and vets concur. For those who said that it wasn’t effective for large dogs, make sure that you order the right size for your breed. If your pup doesn’t like the flavor, try mixing it in with a high quality food, such as Taste of the Wild Dog Food or Blue Buffalo Dog Food, as these premium quality products might disguise the flavor better. With Bayer Quad Chewable Dewormer, you will be able to manage four of the most common types of parasitic worms that affect dogs: tapeworms, roundworms, hookworms, and whipworms. Bayer is one of the most trusted names in animal pest control and prevention, including flea collars and flea treatments for dogs, so you can be sure that you will be using a product that has been made to specifically combat worm infestations and is safe for dogs. 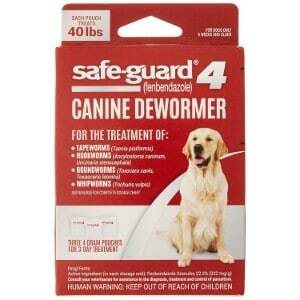 This dewormer for dogs contains a blend of ingredients, including febantel, praziquantel, and pyrantel pamoate. Combined, these three ingredients target infestations of hookworms, tapeworms, whipworms, and roundworms, offering fast relieve and lasting protection. The dewormer comes is a chewable tablet, so it’s easy to administer. There are three different sizes available, including for dogs that weigh between 2 and 25 pounds, between 26 and 60 pounds, and 45 pounds or more, so do make sure that you use the proper formula for your pup, and follow the dosage in the instructions provided. Final Verdict: For an affordable, fast acting, long lasting, easy to administer dog dewormer, Bayer Quad Chewable Dewormer is a great option. The majority of customers are very pleased with this product, as were our panel of experts. If your pup does give you a hard time taking it, try hiding it in a tasty dog treat. Another product from Bayer, the Tapeworm Dewormer for Dogs is designed specifically to treat infestations of tapeworms. While this wormer for dogs only works on tapeworms, it targets them extremely fast. Additionally, it works on both forms of tapeworms that affect dogs: Taenia pisiformis and Dipylidium caninum. 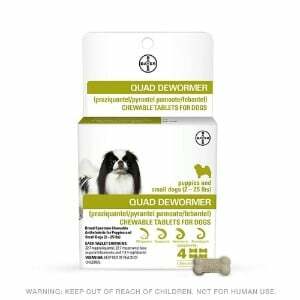 Each tablet of thisdewormer for dogs contains 34 mg of praziquantel, and highly effective ingredient that targets tapeworms quickly that is usually found in prescription strength tapeworm medications for dogs. In fact, as long as you follow the instructions, you should start to see results within as little as 48 hours. Most people have reported that this product quickly got rid of tapeworm infestations in their dogs. This treatment is easy to administer; you can give it directly to your pup or crumble it up and mix it in with his food. It’s safe for use with dogs that are as young as four weeks old. 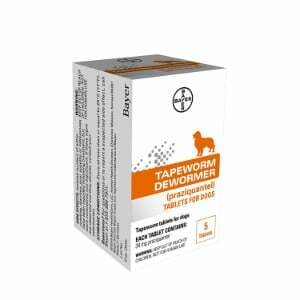 Final Verdict: Our panel of experts and customers who have used Bayer Tapeworm Dewormer for Dogs have said that it is an extremely fast and effective treatment for tapeworms. However, do note that it only works on tapeworms, so if your dog has other types of worms in addition to tapeworms, he’ll need another type of treatment, as well. This dewormer from Durvet is made to treat medium and large breed dogs that have been infested with worms. So, if you have a Golden Retriever, a Labrador Retriever, a Masttif, a German Shepherd, a Saint Bernard, a Rhodesian Ridgeback, or any dog that is 25 pounds or larger, than this product is for you. Durvet is a broad spectrum dewormer, meaning that it is meant to kill a large variety of worms; specifically, it treats seven different strains of tapeworms, roundworms, and hookworms. The active ingredients in this product include pyrantel pamote and praziquantel, and each table contains 114 mg of each ingredient. The package comes with 12 doses of the dewormer, so your dog will be well protected from these parasitic worms for a long time. The tablets are chewable, and most users report that they are easy to administer and that the majority of dogs find them palatable. This medication is prescription strength, which means you don’t have to make a trip to the veterinarian to receive fast and effective treatment for your dog. Final Verdict: Our panel of experts and the majority of customers who have used Durvet Triple Medum and Large Dog Wormer said that it is highly effective and offers fast results. It’s also very easy to administer, which is a big plus. On the downside, some users did say that they weren’t pleased with the results; however, they didn’t elaborate why. 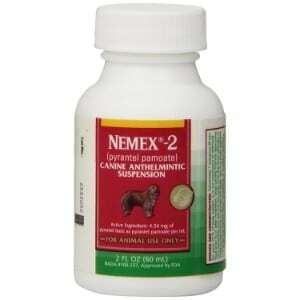 Last up on our list of the best dewormers for dogs is Pfizer Nemex 2. Pfizer is one of the most trusted manufacturers of all types of treatments for ailments in both humans and canines, so you can be sure that you will be getting a high quality product with this treatment. 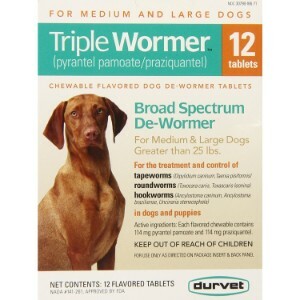 Unlike the other dog wormers on our list, which are tablet dewormers, this option is a liquid formula. Since it’s liquid, there’s no need to crumble it up to give to your dog; simply apply one teaspoon per 10 pounds of your dog’s body weight to his food and he’ll have fast and effective treatment for roundworms and hookworms. This dog wormer is also effective for use with dogs of all ages, including puppies that are as young as two weeks old. The active ingredient in this formula is pyrantel pamoate, which is one of the most effective ingredients for treating worms. The majority of customers who have used this product have said that it is easy to use and that it offers very fast and effective treatment. Our panel of experts agrees. Final Verdict: If you are looking for a fast and effective way to treat worms in your dog, than Pfizer Nemex 2 is a great product to consider. It contains prescription strength ingredients that are specifically designed to kill roundworms and hookworms. While it’s highly effective for the worms that it dog has other types of parasitic worms in addition to the types that this formula treats, you’ll need to use an additional treatment. Your dog is more than just a pet; he is a member of your family. That’s why you always go the extra mile to ensure that he is well cared for and has the best of everything. Like most pup parents, you have probably invested in the highest quality products for your furry friend; the most supportive dog bed, a secure dog crate, a dog house that offers the best features, a spacious outdoor dog kennel where he can safely enjoy exercise when you’re not able to take him for walks, and perhaps even a dog playpen to keep him protected when you can’t keep your eyes on him are just some of the products that you have for your canine companion. You’ve likely put a lot of thought into other products to keep him protected, healthy, and happy, too, such as a dog seat belt for those car rides, an electronic dog door so he can get in and out of your house with ease, and maybe even a dog stroller so that he can enjoy long strolls without being over-exerted. On top of all of everything else you do and all of the dog care products you have for your furry best friend, there’s no doubt that you’ve also put a lot of effort into protecting him from those pesky critters that are attracted to dogs like magnets. For example, your pooch like wears the highest quality flea collar to keep pests at bay, or you apply a flea treatment for dogs to kill and prevent infestations of fleas and other pests. It also goes without saying that you take him to the vet for regular checkups and immunizations, too. Despite your best efforts to keep your dog safe and healthy, unfortunately, there’s still a chance that he could be harmed by something that you can’t see: parasitic worms. What are parasitic worms? How can they affect your dog? How can you treat them? In this portion of our dog dewormer review, you’ll find the answers to all of these questions. Dogs, like all living beings, are susceptible to parasites, including worms that affect the intestinal tract. These parasitic worms hide out in soil and feces, and many dogs like to roll around in or eat soil and feces (it’s just a dog’s nature!) Unfortunately, if what they have rolled around in or eaten is contaminated with parasitic worms, there’s a very good chance that a dog will be infested. An infestation of intestinal parasitic worms can cause a number of severe problems for your dog. As these worms take refuge in your dog’s intestinal tract, they absorb the nutrients that your pup is supposed to be ingesting. In other words, your pup isn’t absorbing the nutrients, but rather the parasites are. If left untreated, an infestation of parasitic worms can become so severe that your dog’s life could be in jeopardy. If you notice any of these signs, it’s important to seek medical care as soon as possible. Paying a visit to the vet to confirm an infestation is a must. If an infestation is confirmed, using the best dog dewormer for dogs is an absolute must. If your dog has been infected with intestinal worms, the best way to combat the problem is by offering your four-legged friend a high quality dog dewormer, like the products we’ve liste in this review. Dog worm medication contains ingredients that are designed to attack the parasitic worms that have taken up residence in a canine’s intestinal tract. They work by attacking the nervous system of the worms, which paralyzes them, causing them to release their grip on the infected dog’s intestinal tract so that they can be passed through the stool. In addition to using dewormers for dogs to treat infestations of worms, you can also use them as a preventive measure. Like most products that are made for pets, there are dozens of dog dewormer products on the market. With so many options to choose from, it can be hard to determine which products are the best. In order to find the best dewormer for dogs, we assembled a panel of experts, which included veterinarians, and conducted extensive research. We reviewed dozens of dog deworming products, tested them out, and read through reviews that customers provided for each option. Based on our findings, we concluded that the five products that we reviewed above where the best over the counter dewormers for dogs. The health and safety of your pet is of utmost importance. Given the fact that parasitic worms that infect the intestinal tract can cause serious health issues, offering treatment with the best possible dog deworming product is an absolute must. By being aware of the signs of worms, treating an infestation with the best dewormer for dogs is essential. You can also offer wormers for dogs as a preventative measure to avoid issues in the first place. The five over the counter dewormers for dogs that are listed in our review are some of the best products on the market. There are also several other options to choose from, of course; but, before you decide to give your pet another type of medication, make sure that you check with your veterinarian to confirm the efficacy of the product.